Adrian Mifsud holds the 2002 MFA Player of the Year award. Adrian Mifsud was, in my opinion, one of the best strikers of the modern era in Maltese football. Small in stature, Mifsud was a pacey and deadly striker who made a name for himself with Rabat, Hibernians, Sliema and Floriana. Born on December 11, 1974, Mifsud received his primary school education at the Sacred Heart School in Marsa and then continued his studies at the Archbishop’s Seminary in Rabat. Mifsud played football at school before he joined the nurseries of Ħamrun Spartans, Birkirkara and Zurrieq. His abilities were there for all to see but no one seemed to be able to hold on to this talented youngster for long. At 16, he joined Sta Venera Lightings with whom he made his Division Three debut in 1991. His incredible speed on the ball and ability to score goals soon drew the attention of the big clubs and in 1995 he joined Rabat in the Premier Division. 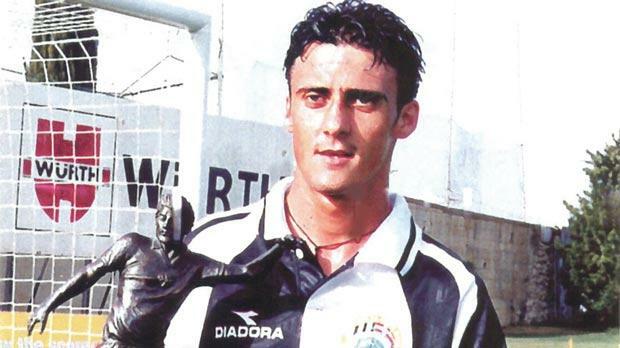 Mifsud made his top-flight debut for the Magpies on September 9, 1995, against Hibernians and from then on he never looked back. In his first season, he played 13 league matches for Rabat, scoring five goals in the process. His pace and raiding qualities on the right flank along with his accurate stabs at goal made him the most impressive newcomer of the season. In 1996-97 Rabat were relegated but the following season they made a quick return to the Premier League. Rabat showed their determination to win promotion with a series of impressive displays which enabled them to overcome the stiff challenge of St Patrick’s FC. Ajax ended their league campaign with a five-point lead over their closest rivals. Mifsud was the architect behind Rabat’s excellent season with some first-class performances. He was the club’s top scorer with 11 goals from 16 matches. Back in the Premier Division, Mifsud continued to hit in the goals even though he was playing in a team haunted by relegation. It was inevitable that he would attract the attention of the big guns with Hibernians tabling the best offer and in December 1999 Mifsud joined the Paolites. It was with Hibernians that Mifsud finally reached hispeak. In 2001-02, when Hibs won the championship, he scored 27 goals in the league, breaking club’s season goals record of 22 established by Karl Zacchau in 1992-93. In just five seasons he broke the club’s all-time league goals record of 72 goals held by the legendary Ernest Spiteri Gonzi since 1985. Up to the end of the 2003-04 he had increased his record to 79 goals. 2001-02 was definitely the best season of his career. Mifsud’s 27 league goals tally was second only to Danilo Doncic who topped the scoring charts on 32 goals. But Mifsud made up for the disappointment of missing out on the golden boot when he was named Footballer of the Year for that season. He was also named as the Best Maltese Player and the Best Striker in the first-ever Malta Football Awards contest held on Saturday July 6, 2002. At the end of the 2003-04 season Mifsud decided to join Sliema. More success followed with the Blues before he moved to Floriana and after a couple of seasons with the Greens he returned for short spells with Hibernians and Rabat before he hung up his boots. In a career spanning over 13 seasons, he made 290 first-class appearances and scored 139 goals. He also earned 15 caps for the Malta national team.